On Election Day, November 8, 2016, the voters of Jersey City will have a lot to consider both on a National and local level through a series of very important ballot questions. The Jersey City Parks Coalition has advocated for the creation of a Municipal Open Space, Recreation and Historic Property Preservation Fund to create dedicated funding for our municipal parks, open spaces, and preservation of our historic resources. It is a non-binding referendum which means the City is gauging the residents’ willingness to pay a small amount of money directed specifically to improve, repair, develop and acquire open space and parks and the preservation of historic structures. Should the Municipal Council of the City of Jersey City establish a Municipal Open Space, Recreation and Historic Property Preservation Fund, pursuant to N.J.S.A. 40:12-15.7 to be funded at a rate not to exceed $0.02 per $100 of assessed valuation of each annual tax levy commencing with the first tax quarter for calendar year 2017 and used exclusively for the acquisition, development and maintenance of lands for recreation, conservation and historic purposes? Much like what’s being proposed here, Hudson County voters approved a countywide open space trust fund in 2003 that is expected to bring in $20 million this year (that tax is one cent per $100 of assessed value). In Jersey City, the fund was used to expand Boyd McGuiness Park, rehabilitate soccer fields at Caven Point, fund the creation of Berry Lane Park and more. Since 1988, the United States has seen 2,524 ballot initiatives approving new taxes for open space, according to the Trust for Public Land. 1,902 have passed. As of last November, voters have approved open space trust funds in 237 New Jersey municipalities and all 21 counties. The only municipality in Hudson County with its own open space trust fund is Hoboken, approved by voters in 2007. The ballot initiative was passed 62 to 38 percent. The two-cents-per-$100 tax led to an expected $2.24 million this year. 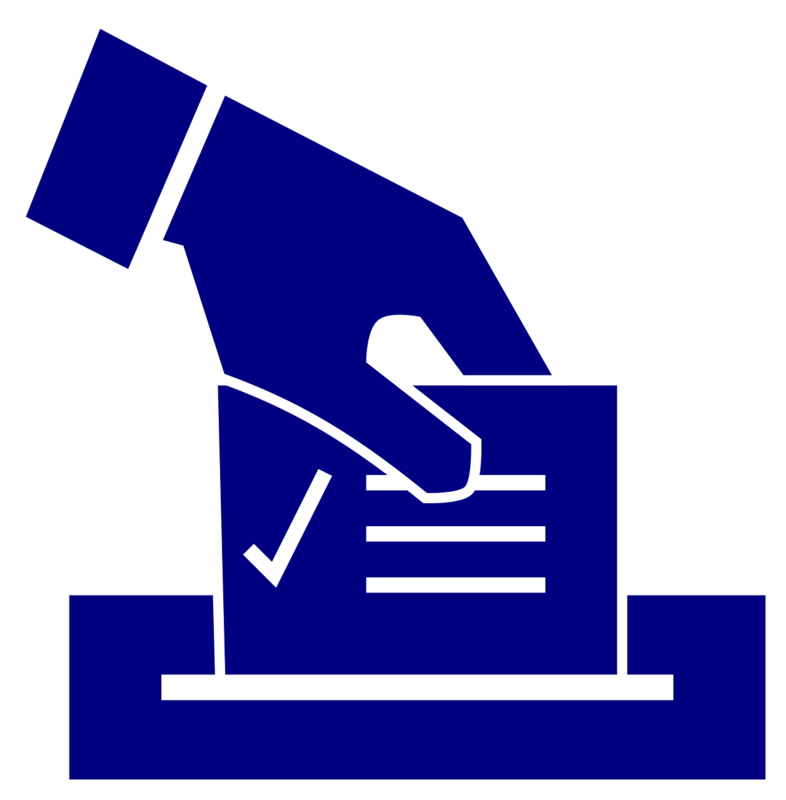 To levy the tax after voters have approved a ballot question, the county or municipal governing body must adopt an ordinance that establishes the dedicated tax, sets up a separate trust fund to hold the tax proceeds, and states the purposes for which they may be used, as proposed in the ballot question. Full public disclosure and a review of all expenditures would be required and only used for identified purposes. Another advantage would be that the City becomes eligible for a greater match of funds through the State Green Acres program and other public & private sources maximizing the City’s investment. A YES vote assures that in the future old and dying trees in our parks will be readily replaced, park equipment will be repaired quickly and updated periodically, parks will be kept safe and usable for everyone. There will even be funds available for historic preservation of significant Jersey City structures and sites. It’s up to you. Make certain to vote on November 8th and let’s keep Jersey City parks and historic sites the best they can be for many future generations. The Jersey City Parks Coalition (JCPC) intends to distribute 150 FREE trees to the residents of Jersey City from a 2016 Tree Giveaway Award from the Alliance for Community Trees. This opportunity is made possible through a partnership with CSX Transportation and the Arbor Day Foundation. 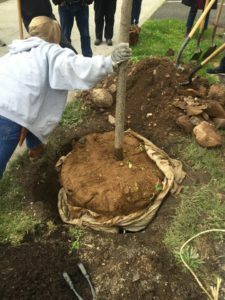 The JCPC was one of 12 organizations chosen nationwide to accomplish one of the City of Trees goals, including residents planting and caring for trees on their own property. In partnership with the City of Jersey City, New Jersey City University, Rutgers Cooperative Extension, New Jersey Tree Foundation and the most essential component; an army of passionate and trained residents called the Jersey City Tree Lovers Crew (JCTLC); the Jersey City Parks Coalition plans to plant 5,000 trees over the next five years leading up to the year 2020 as part of their City of Trees Program. The free tree is provided to the applicant after participation in one of the tree care workshops scheduled for what the JCPC is dubbing Octreeber, a month-long celebration of tree awareness and planting events. The workshops will be held on the following dates and locations: Saturday, October 1st at the Bethune Center, Sunday, October 9th at Harsimus Cemetery, Sunday, October 16th at the Riverview Farmer’s Market. All workshops are from 10 am – 11:30 am. Admission is free and open to all residents wishing to know how to care for the trees that they already have. August 15, 2016 Two Hudson County Municipalities Receive Forestry Grants from the DEP. A pair of Hudson County municipalities are receiving state grants for the preservation and promotion of forestry, the New Jersey Department of Environmental Protection announced. Secaucus and Jersey City are among the 32 municipalities statewide awarded $1.5 million to promote stewardship of community forests and trees through the implementation of Community Forestry Management Plans. Jersey City was granted $300,000 – the maximum amount given to individual towns – while Secaucus was granted $30,000, a spokeswoman from the DEP said. “Active stewardship by our local governments, community volunteers and partners through these urban and community forestry projects is one of the most critical ways to ensure residents across New Jersey will see healthier and more sustainable forests,” John Sacco, assistant director of the State Forest Service, said in the release. …[T]he realities of urban living often create the need for great public greenery. Be it in a house, an apartment, a condo or a loft, many city dwellers are putting emphasis on being near parks and green space, a trend one local group is hoping can help make Jersey City’s parks the best that they can be. The latest effort, dubbed City of Trees, is the brainchild of the Jersey City Parks Coalition. Founded in 2004 and made up of twenty neighborhood and open space groups, the Coalition spearheaded the 2011 Big Dig Project, which was undertaken in October that year and continued through 2014. The effort saw the group distribute and plant over 238,000 daffodil and tulip bulbs, one of the largest local beautification projects ever in Jersey City. April 22, 2016 – Ambitious Jersey City Parks Coalition plan is tree-rific! The Jersey City Parks Coalition announced plans today to plant 5,000 trees across the city over the next five years. Jersey City Mayor Steve Fulop joined the vice president of the coalition, Mory Thomas, in a press conference at City Hall to announce the “City of Trees” initiative. The city has committed $60,000 for each year of the five-year project. The first phase of the project, in October, will focus on planting in public parks and open spaces. This past Saturday, May 7, 2016, the Jersey City Parks Coalition had the pleasure of co-hosting the NJ Tree Foundation #NJTF at Dickinson High School. The Foundation came to teach their Tree Keepers Workshop to Jersey City residents. It was a very informative day in school! Tree identification was first up as we were given a guidebook to take us through 10 simple questions of how to figure out what trees you might encounter on the streets. Noting leaf characteristics, bark color, fruit or flowers can all provide signs, to give you a page range, where you’ll find the tree variety. After a few visual drills, everyone was feeling confident. Check done! Have you ever walked down a neighborhood street and come across a tree that doesn’t look so hot? This workshop gives you the tools and know-how to assess a few physical things that might help you figure out what could be the root cause. (sorry for the pun) Does it need pruning? If so, where and why? Is it a safety hazard? Is it dead or dying? Can it make a “come back”? — Let’s just say you’ll leave knowing a lot more than when you walked in the door. One of the first and most common mistakes people make (contractors and self-proclaimed tree experts included) is in the planting. You don’t need a REALLY big hole. You don’t “have to” take the burlap off completely. “You aren’t planting telephone poles!” says Lisa Simms, the Executive Director of the NJ Tree Foundation. Here’s a big one: remove the wire basket used for transport and/or twine before you plop it in the hole. Once in the hole…pull the burlap off of the top and tuck it in around the sides. Check for straightness on the first 3 feet from the ground. (According to NJTF the top will follow suit as it grows.) Next, shovel soil back in around the root ball (don’t put any soil on top) and really stomp the soil down in around the ball so there are zero air pockets (watering a bit can help). To finish: place a 3″ layer of mulch 6″ away from root collar, in a donut formation around the tree then WATER, WATER, WATER! Trees need at least 2″ of water per week until the tree is established, about 2.5 years after planting. So, what was the biggest take away you ask? The biggest take away from the workshop is how easy it is to plant a tree. It’s much harder to keep a tree healthy with water, proper pruning and maintenance. This is why the JCPC believes, at the end of the day, it doesn’t really matter how many trees we plant in Jersey City over the next 5 or more years. What matters is how we care for them. Do we have the infrastructure in place to water and prune all the existing trees in our city today? No. Will we have everything we need for success within the next five years? Probably not. It’s taken cities, larger than ours, 20 plus years to combat apathy towards trees. We will need everyone’s help to create a culture of planting and caring for trees in Jersey City. As with most things in life it all comes down to education. PS. If you are interested in attending a Tree Keepers workshop in the Fall please use the contact us form and ask to be put on a list. We hope to provide many more opportunities for residents and city staff to learn how to plant and care for the trees that help us breathe. The Embankment Preservation Coalition and Jersey City Parks Coalition are organizers of the talk. The Embankment Coalition has worked since 1998 to raise environmental awareness in Jersey City, specifically through its advocacy for the energy-saving preservation and sustainable reuse of the historic Harsimus Branch Embankment and through related trail initiatives. 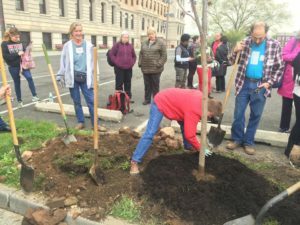 The Parks Coalition, the umbrella organization for neighborhood parks groups, is embarking on a five-year tree-planting program. Parks Coalition president Laura Skolar notes, One way to slow climate change is through reforestation. City of Trees is our modest local initiative to increase the tree canopy in Jersey City. 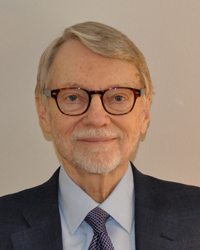 We hope to learn more about what we all can do here from Dr. Baker. New Jersey University School of Business is hosting the talk. Many nonprofit organizations, including the East Coast Greenway Alliance, Friends of Liberty State Park, Jersey City Landmarks Conservancy, NY/NJ Baykeeper, and Hamilton Park Neighborhood Association, and others are contributors. Goldman Sachs is a Jersey City Parks Coalition City of Trees 2016 Education and Engagement Sponsor. October 23, 2015 – Mayor Fulop and the Jersey City Parks Coalition Announce BIGGER DIG 2020 Partnership to Plant 2,020 Trees Over Next Five Years. October 26, 2013 – Take BIG DIG pledge and beautify Jersey City, parks coalition says. The Jersey City Parks Coalition is turning the Oct. 25 national Make a Difference Day into Do-It-Yourself Day. The organization that works to beautify the city one flower at a time has gone out out annually since 2011 for the BIG DIG project and has planted 136,000 daffodils and tulips in parks, public housing and open spaces throughout the city. But “this year is different,” said Laura Skolar, president of the Coalition. “We are asking our volunteers of previous years and any resident of Jersey City to plant either 25 or 50 daffodils on their own property that the Coalition will provide free of charge,” Skolar said. Senior citizen and public housing complexes in Jersey City are getting a makeover today as more than 700 volunteers participate in the Jersey City Park Coalition’s Big Dig 2013, an annual effort to beautify the city. The Big Dig is done in partnership with Jersey City, with help from sponsors like Spectra Energy, CarePoint Health, Liberty Science Center and ADR Bulbs. The volunteers will clean up and plant 65,000 daffodils and tulip bulbs in 10 public housing complexes as part of National Make A Difference Day. Now in its third year [*article written in 2013], after today the Big Dig will have planted 132,000 spring-blooming bulbs in over 200 locations with the help of a total of 2,600 volunteers. For the past three years, Jersey City has demonstrated this civic pride by participating in Make A Difference Day, the annual volunteer effort sponsored by USA Weekend Magazine and supported by the Corporation for National and Community Service, the federal agency for volunteering and service. Youth volunteers help plant tulip and daffodil bulbs on Make A Difference Day 2011 as part of Jersey City’s ‘The Big Dig’ project. For Make a Difference Day 2011, The Jersey City Parks Coalition, conceptualized a citywide planting project named the ‘BIG DIG’. Volunteers would plant hearty tulip and daffodil bulbs in parks and patches of grass throughout the city. Come spring, the fruits of our mutual labor would be reaped. April 11, 2012 – Jersey City’s ‘Big Dig’ beautification project wins national Make a Difference Day award.